This post being done on request from a reader Pranali. I am all for quick low cal wholesome and nutritious meals. 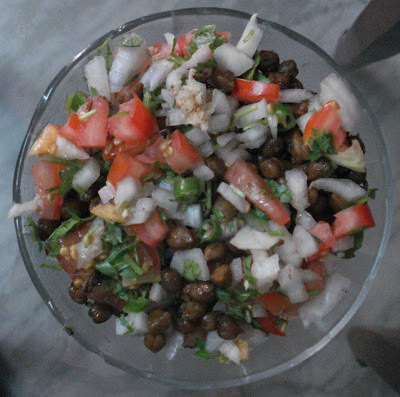 Soak kala (black) chana overnight, pressure cook in half a cup water for 6-7 whistles. 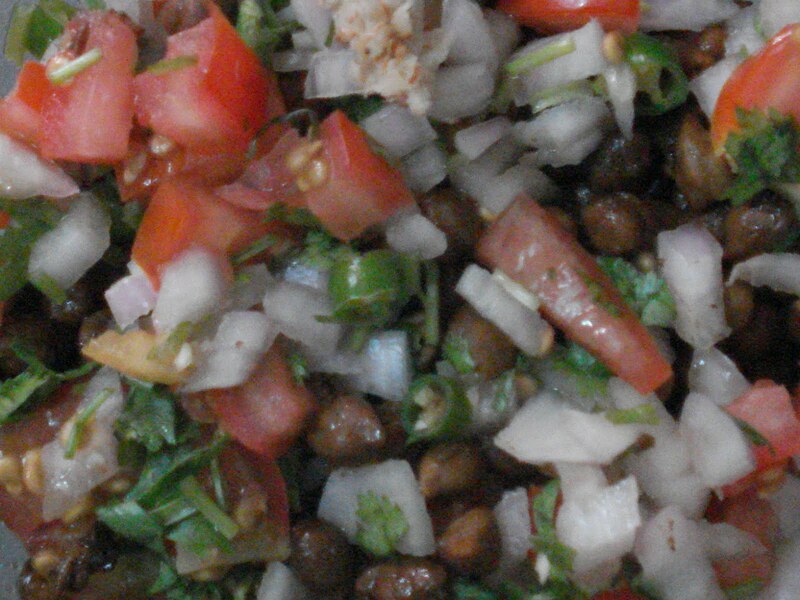 You can make it more nutritious by using uncooked sprouted black chana. Drain, and mix all the above ingredients, toss in a mixing bowl, ur dinner is ready. U can eat this alone, u could eat it with a whole wheat chapatti. U can also put in some paneer and gazillion other veggies u can eat raw to make it more wholesome. This salad makes for an excellent dinner, but I found it a lil hard to digest initially, if taken alone. So I used to team it up with a missi roti or sometimes just a glass of milk. But over a few times I find it pretty filling and easily digestible. Soak it before you dash out for work, and put it on pressure cooker after u hit home. By the time you freshen up, dinner is ready. U can buy a nice chop board and start dicing your favorite veggies to go in this salad. For my little one I generally don’t follow the above recipe. The one she likes is the fully cooked version. Take a kadhai, put half a tsp of oil. Once the oil is hot, put in a pinch of hing and cumin seeds. Once seeds crack up add haldi half a tsp, coriander powder half a tsp and finally put soaked kala chana. Stir for 2-3 minutes on low heat and you are done. Add salt as per taste. Garnish with coriander leaves. it looks super yummy! am making this for dinner! will add bell peppers too to the salad! thnx for the recipe riya! Thanks. M glad u found this useful. Hi Riya , how are you ? Even I love simple lentil salads like the above :) :) . Hey Khaddu, m gud. Thanks for the award.